Stereotactic radiosurgery (SRS) is a technique to precisely deliver high doses of hypofractionated radiation therapy with minimal or no treatment margins. There is a paucity of literature on the role of radiosurgery in the management of pediatric patients. Although radiosurgery has been established in the treatment of certain benign central nervous system (CNS) diseases in children, its role in the treatment of pediatric CNS malignancies is evolving. The purpose of this article is to review the literature and current applications of radiosurgery for the pediatric population. Treatment for AVMs is by far the most well established use of radio-surgery in children. An illustrative case of a pediatric patient treated with SRS for a left frontal AVM is shown in Figure 1. The largest and most pertinent studies will be reviewed here. A study from University of California, San Francisco (UCSF) evaluated dose effects on obliteration rates of 80 pediatric patients treated with SRS for AVM. The study found a 3-year overall obliteration rate of 56% for dose prescription of 18-20 Gy, and 16% for dose < 18 Gy.1 At 5 years following SRS, cumulative incidence of hemorrhage was 25%. Functional status improved or remained the same as before treatment in 66% of patients. The study concluded that low marginal dose minimizes SRS-related neuro-logical deficits but leads to low rates of obliteration and high rates of hemorrhage. To maximize AVM obliteration and minimize post-treatment hemorrhage, the authors recommended a prescription marginal dose of ≥ 18 Gy. A study from the University of Virginia reviewed 51 unruptured pediatric AVM patients with actuarial AVM obliteration rates of 29%, 54% and 72% at 3, 5 and 10 years after radiosurgery, respectively.2 The obliteration rate was significantly higher with dose ≥ 22 Gy (p = 0.003) and for nidus with ≤ 2 draining veins (p = 0.001). The annual post SRS hemorrhage rate was 1.3%, and the incidence of cyst formation was 2%. Incidence of radiographic, symptomatic and permanent SRS-induced changes were 55%, 16% and 2%, respectively. The largest series published on SRS for pediatric AVMs is a study from the University of Pittsburgh, which reviewed 135 children treated with Gamma Knife (Elekta, Stockholm, Sweden) radiosurgery (GKRS).3 The median target volume was 2.5 cm3 (range 0.1–17.5 cm3), and median number of isocenters was 4 (range 1–17 Gy). Median GKRS prescription dose to the nidus margin was 20 Gy (range 15–25 Gy), which correlated with median maximum target dose of 40 Gy (range 30–50 Gy). A reduced dose was prescribed for large AVMs and nidus located in an eloquent area as per published risk/benefit prediction curves based on the 12 Gy volume.4 Of note, the same dose selection criteria was used for both pediatric and adult patients treated at their institution. Pediatric AVM obliteration rates at 3, 4, 5 and 10 years were 45%, 64%, 67% and 72%, respectively. Median time to complete obliteration was 48.9 months. The overall annual AVM hemorrhage rate was 1.8%. Rates of hemorrhage at 1, 2, 3, 5 and 10 years were 0%, 1.6%, 2.4%, 5.5% and 10.0%, respectively. Permanent radiation-induced neurologic deficits developed in 2 children (1.5%) after SRS. Delayed cyst formation occurred in 1 patient (0.7%). Despite promising results with SRS, advances in microsurgical resection have improved surgical outcomes for AVM. A large retrospective review from Boston Children’s Hospital reviewed 94 pediatric patients treated with microsurgical resection for AVMs, of which 21% received adjunctive preoperative embolization. The obliteration rate was 94%, and the most recent 50 patients in the series underwent immediate perioperative angiography, which improved the obliteration rate from 86% to 100% (p = 0.01).5 Perioperative neurological deficits occurred in 17% of the children treated. According to the modified Rankin Scale used for analysis, 94% of patients had good functional outcomes. A review of 1- and 5-year follow-up data indicated an overall annual hemorrhage rate of 0.3% and a recurrence rate of 0.9%. SRS has been well established as a viable treatment option for vestibular schwannoma (VS) in adults.7 In fact, one can argue that SRS is a superior treatment to microsurgical resection for vestibular schwanomma, considering equivalence in local control and superior functional outcomes and quality of life after treatment with SRS.8,9 The excellent outcomes in adults have prompted investigation on the use of SRS in children. A study from South Korea enrolled 24 children with neurofibromatosis type 2 (NF2) who underwent GKRS for VS.10 The mean target volume treated was 4.8 ± 3.2 cm3 and mean marginal dose was 12.4 ± 0.6 Gy prescribed to the 50% isodose line. With a mean follow-up time of 89.3 months, the tumor control rate was 35% at 3 years. The mean growth rate of VS was 0.33 cm3 /year. The actuarial rate of useful hearing preservation was 67% at 1 year and 53% at 5 years. Disappointingly, these results are worse than previous reports in adults. It is important to note, however, that rates of tumor control and hearing preservation in general are worse for VS associated with NF2 than in sporadic cases.11 Other treatment options are under investigation, including bevacizumab for tumors that express vascular endothelial growth factor (VEGF), but the limited results are not very promising as an alternative treatment.12,13 Further investigation is needed to determine the efficacy of SRS for VS in children. Figure 2 describes a pediatric patient with NF2 treated with radiosurgery. Craniopharyngioma is typically managed by surgical resection followed by adjuvant radiation therapy for residual disease. However, for residual or recurrent cases, radiosurgery has been implemented. A study in Japan of 107 patients with craniopharyngioma treated with SRS to a dose of 11.5 Gy included 38 children.14 Progression-free survival (PFS) at 5 and 10 years was 60.8% and 53.8%, respectively, among the entire cohort. However, local control was worse when comparing children and adults, with 32% of children progressing after treatment, compared with 13% of adults. A study from South Korea included 14 pediatric patients who developed recurrence after gross total resection (GTR) for craniopharyngioma.15 Five patients were treated with GTR, 1 with fractionated RT, 4 with GKRS, and 4 with subtotal resection followed by RT. GKRS tumor margin dose was 11.2 Gy (range 9-14 Gy) and mean target volume was 1719 mm3 (range 424-6874 mm3). Local control rate after GKRS or fractionated RT was 100% at mean follow-up time of 75 months after salvage treatment. Advances in cancer therapy leading to prolonged survival may increase the incidence of brain metastases in children.16 Despite this, the overall number of children with brain metastases is low, and the prognosis is poor. A retrospective review of pediatric oncology patients at MD Anderson found that only 1.4% of children either presented or developed a brain metastasis, with the majority (60%) presenting with a single brain metastasis.17 Kaplan-Meier estimates for median survival in children treated with brain metastases is 8 months. Although uncommon, secondary brain tumors are a feared side effect of fractionated radiotherapy to the brain. A single institution reported a median time frame of 114 months in development of secondary brain tumors after previous cranial irradiation in children treated at a median age of 8 years old.18 SRS may potentially reduce the chance of second malignancy by minimizing the volume of normal brain receiving radiation dose compared with whole-brain radiation therapy (WBRT).19 As well, there is interest in minimizing cognitive compromise in children undergoing radiation therapy to the brain. SRS can reduce the likelihood of cognitive decline, which is a potential side effect of WBRT. Currently, there are no published papers in the literature on SRS for brain metastases in children. Instead, the impetus for SRS treatment of brain metastases in children relies on extrapolation from treatment results in adults. A recent meta-analysis of phase 3 trials evaluating SRS with or without WBRT demonstrated that SRS alone favored survival in adult patients ≤ 50 years of age.20 In addition, omission of WBRT did not affect distant brain failures. Perhaps these results, which demonstrate that younger patients have improved outcomes with SRS alone, may persuade pediatric radiation oncologists to pursue studies of SRS alone in children. Figure 3 illustrates a case of pediatric brain metastases treated with SRS. The extent of surgical resection is the most important factor affecting prognosis for ependymoma. For children with incomplete resection, 5-year disease-free survival drops by approximately 50% compared with gross total resection, leading to lower overall survival.21,22 SRS has been implemented as a boost for residual disease after fractionated radiotherapy and to treat recurrent ependymoma after initial management.23 The largest published study in the pediatric population is a retrospective analysis of 21 children treated with SRS for recurrent ependymoma, which demonstrated 72% local control at 27.6 months.24 The median prescription dose delivered to the tumor margin was 15 Gy (range 9-22 Gy). PFS was 78.4%, 55.5% and 41.6% at 1, 2 and 3 years, and distant tumor relapse rate was 33.6%, 41.0% and 80.3% at 1, 2 and 3 years, respectively. Overall, treatment was well tolerated with adverse radiation effects seen in 2 patients. Low-grade gliomas are slow growing and usually managed with surgical resection alone, especially in the pediatric population. Adjuvant radiation therapy is generally not recommended. However, if the lesion is unable to be completely resected, radiation therapy may be warranted. Radiosurgery is being used for pediatric low-grade gliomas in cases of incomplete resection or recurrent disease. A review of 24 pediatric patients treated at the University of Virginia with GKRS for unresectable, residual or recurrent gliomas demonstrates that good clinical control can be achieved.25 The majority of the patients (80%) presented with low-grade gliomas. With a median tumor margin prescription dose of 15 Gy (range 4-20 Gy) and imaging follow-up of 74 months, decrease in tumor volume was 71% after GKRS. At last follow-up, ≥ 50% size reduction was seen in 75% of patients, and complete response was seen in 21%. PFS was achieved in 83% of patients treated. Of the 4 patients who progressed after treatment, 3 underwent repeat resection and 1 died. A review of 50 patients treated with GKRS for newly diagnosed or recurrent juvenile pilocytic astrocytomas was performed at the University of Pittsburgh.26 The majority of patients had no prior radiation; only 5 patients underwent prior fractionated radiation therapy +/- chemotherapy. Median target volume was 2.1 cc and median marginal dose was 14.5 Gy (range 11-22.5 Gy). PFS after SRS (including tumor growth and cyst enlargement) was 91.7%, 82.8% and 70.8% at 1, 3 and 5 years, respectively. The authors suggest SRS for pilocytic astrocytomas when resection is not feasible or for recurrent disease. Fractionated stereotactic radio-therapy (FSRT) is an alternative to SRS for radiation treatment of pediatric patients with minimal margins. FSRT utilizes SRS immobilization devices to minimize margins for treatment with daily fractionated radiotherapy. A large prospective trial of 81 pediatric patients with low-grade gliomas treated with FSRT for disease progression after initial chemotherapy or surgery was conducted at Dana-Farber Cancer Institute in Boston.27 Of the patients evaluated, 50 had low-grade astrocytoma, 23 had craniopharyngioma, 4 had posterior fossa ependymoma, and 4 had other histologies. PTV included preoperative tumor + 2 mm margin. PFS was 82.5% at 5 years and 65% at 8 years. Local progression occurred in 6 patients, all within the primary tumor bed. Since no marginal failures occurred, the study results support the use of limited margins with FSRT to minimize late effects of radiation therapy. However, one of the biggest drawbacks of FSRT is that daily anesthesia may be required for younger children, which can be logistically challenging, lead to significant health care costs, and pose potential unnecessary health risks such as anesthesia-induced neurotoxic effects on the developing brain.28 Because of this, radiosurgery appears to be more feasible and attractive over FSRT. The largest series of pediatric patients treated with SRS for high-grade gliomas is a review of 90 patients from the Joint Center for Radiation Therapy in Boston.29 Breakdown by histology is: glioblastoma = 10, anaplastic astrocytoma = 8, medulloblastoma = 16, primitive neuroendocrine tumor = 5, ependymoma = 28, other histologies = 23. Intention to treat was for recurrent tumors in 62 patients and for initial management of residual tumors in 28 patients. Gross disease was present in 81 patients, and 9 patients underwent SRS to the resection cavity due to concern for high risk of local failure. Median prescription dose was 12.5 Gy (range 6–25 Gy), normalized to the 80% isodose volume (range 40% to 100%). Table 1 shows PFS and local control by histology. The 3-year risk of radionecrosis was 26%. Of the patients who underwent reoperation for radionecrosis, 9 of 19 patients on pathologic review had radionecrosis alone. Other findings included mixed tumor and necrosis in 8 patients, tumor alone in 1 patient, and benign findings in 1 patient. At the University of Pittsburgh, 7 children with recurrent PNET were treated with GKRS. Median tumor volume was 4.6 cm3 (range 1.2-13.1 cm3), and median prescription dose was 16 Gy (range 13-20 Gy). Following salvage GKRS, 2 patients experienced early disease progression with median survival of 5 months, while 5 patients had late progressive disease with median survival of 30 months.30 Of the 5 children with late progression, 4 were retreated with GKRS for disease relapse without any adverse radiation events. Median GKRS re-treatment tumor volume was 1.3 cm3 (range 1.1-3 cm3), and median re-treatment prescription dose was 13 Gy (range 9-16 Gy). One patient underwent a third GKRS procedure to a dose of 16 Gy without complications for re-treatment of a pineal PNET, which recurred after 2 prior GKRS treatments. This study highlights the safety of repeat GKRS for PNET recurrences. Radiosurgery was first proposed as an effective and safe treatment option for medulloblastoma by the Joint Center for Radiation Therapy.31 With a modified linear accelerator, SRS was used to boost residual disease in 3 patients and was implemented for salvage treatment in 11 patients for recurrent tumors. Median tumor dose was 12 Gy, and median tumor volume was 6.9 cm.3 All patients had prior craniospinal irradiation. With median followup of 27 months, none of the patients failed locally within the radiosurgery target volume. Median survival after SRS for recurrent medulloblastoma was 10 months, with distant recurrence within the CNS as the predominant site of failure. The authors conclude that although SRS is highly effective for local control in medulloblastoma, the high incidence of distant recurrence indicates that SRS alone is insufficient for long-term disease control. Systemic therapy should be used in conjunction with radiosurgery to improve survival in patients with recurrent medulloblastoma. A study from Germany evaluated FSRT and SRS for recurrent medulloblastoma in 20 patients with 29 treatment sites.32 All patients received prior craniospinal radiotherapy with boost to the posterior fossa for a total dose of 54 Gy. SRS was used to treat 8 areas of recurrence with a mean dose of 15 Gy (range 10-18 Gy), while FSRT was used to treat 21 lesions to a fractionated dose of 24 Gy. Overall local control was 89.7%. None of the patients developed late toxicities such as brain radionecrosis. Taking into account prior experiences with radiosurgery for medulloblastoma, a small case series from the UK reported the utilization of dose escalated radiosurgery for metastatic relapse of medulloblastoma in 3 children.33 GKRS treatments were taken to a much higher dose than previously published reports for medulloblastoma with a mode prescription dose of 25 Gy. A total of 6 treatments were well tolerated with no adverse events reported and prolonged PFS was achieved with complete remission seen in 2 patients with MRI follow-up of 30 months and 39 months. The other patient achieved stable disease at 4 years follow-up. This case study is a good example of how pediatric radiosurgery dose and treatment recommendations can evolve over time based on limited prior experiences in the literature. Local anesthesia alone is typically used when treating an adult patient with frame-based SRS. However, a young child may not be able to tolerate the treatment awake and may need general anesthesia. Anesthesia delivery systems with propofol for children is an area of ongoing research. A remote-controlled patient management system consisting of propofol-based general anesthesia with target-controlled infusion was designed in Japan specifically for pediatric GKRS.37 However, patients who are < 30 kg and < 16 years-old cannot be managed with this system. Therefore, a manually controlled infusion method was developed to treat pediatric patients who are not candidates for the remote-controlled system.38 Although the manual infusion is less accurate than the target-controlled infusion, propofol concentrations of 3.0-4.0 μg/ml, which are the recommended levels for pediatric GKRS, can be achieved. The pathophysiology of radiation necrosis is a coagulative process that predominantly affects white matter. It is caused by small artery injury and thrombotic occlusion. Initial management typically consists of high-dose steroids, but other options include vitamin E, pentoxifylline, and hyperbaric oxygen.39 Bevacizumab has been shown to be effective in managing radiation necrosis in adults, but potential side effects include thrombosis, pulmonary embolism, GI perforation, wound dehiscence and severe hypertension.40 Although not studied extensively in children, a case series from University of Colorado reviewed 4 children with diffuse pontine glioma who were treated with bevacizumab after developing radiation necrosis. On follow-up, 3 children had significant clinical improvement and were able to discontinue steroids. One child continued to decline, but on further imaging was found to have disease progression rather than radionecrosis. Bevacizumab was well tolerated in all 4 children. A recent case series of 2 pediatric patients who developed medically refractory radiation necrosis after SRS for AVM were treated with bevacizumab.41 In this study, a lower drug dose was delivered using a single intra-arterial infusion of 2.5 mg/kg bevacizumab after hyperosmotic blood brain barrier disruption (BBBD) as opposed to intravenous infusion. The goal was to decrease potential complications from high-dose bevacizumab administration in children while increasing target delivery. At 8.5 months follow-up, both patients experienced pain relief from previous headaches and resolution of cushingoid features after weaning off steroids. One of the children regained significant motor strength. There was > 70% reduction in cerebral edema on imaging follow-up. The study concludes that intra-arterial administration of a single low dose of bevacizumab after BBBD was safe and resulted in durable clinical and radiographic improvements at concentrations much less than required for systemic intravenous drug delivery. Advantages over the intravenous route may include decreased systemic toxicity, higher concentration of drug delivery to the affected brain, and lower cost. An important but often unaddressed aspect of patient management is follow-up indications and radiographic findings after treatment. A study from University of California, San Diego (UCSD) reviewed serial MRI brain scans following SRS for treatment of pediatric primary brain tumors. Among 21 lesions treated, 8 lesions met Response Evaluation Criteria In Solid Tumors (RECIST) v1.1 criteria for progressive disease at 6 months.42 However, on further follow-up imaging, it was found that 3 of 8 initially assumed treatment failures on MRI represented transient tumor edema, with 2 of the lesions later developing a complete response at 15 months, and the other lesion qualifying as stable disease at 12 months. This study highlights that early lesion enlargement after pediatric SRS may not necessarily indicate treatment failure, and follow-up imaging may be warranted before pursuing further treatment or interventions. When treating children with radiation therapy, radiation-induced toxicities such as cognitive decline are of particular concern. The combination of a steep dose gradient and high conformality makes radiosurgery a particularly appealing treatment option for the pediatric population by allowing physicians to deliver high dose to the target volume while minimizing dose to surrounding normal tissues. It is also a valuable treatment option for children who develop recurrent disease. However, one of the challenges in establishing guidelines for pediatric radiosurgery is the limited sample size of treated patients compared with the adult population. A summary of pediatric SRS prescription dose by disease site based on references from this review article is provided in Table 2. Moving forward, indications for the appropriate utilization of radiosurgery in children will need to be driven by the experience of centers of excellence in radiosurgery and pediatric radiation oncology, as well as clinical trials. A multidisciplinary research approach including neurosurgeons, radiation oncologists, pediatric oncologists, and anesthesiologists is paramount in optimizing the management of children treated with radiosurgery. Potts MB, Sheth SA, Louie J, et al. Stereotactic radiosurgery at a low marginal dose for the treatment of pediatric arteriovenous malformations: obliteration, complications, and functional outcomes. J Neurosurg Pediatr. 2014;14(1):1-11. Ding D, Xu Z, Yen CP, et al. Radiosurgery for unruptured cerebral arteriovenous malformations in pediatric patients. Acta Neurochir (Wien). 2015;157(2):281-291. Kano H, Kondziolka D, Flickinger JC, et al. Stereotactic radiosurgery for arteriovenous malformations, part 2: management of pediatric patients. J Neurosurg Pediatr. 2012;9(1):1-10. Flickinger JC, Kondziolka D, Lunsford LD, et al. Development of a model to predict permanent symptomatic postradiosurgery injury for arteriovenous malformation patients. Arteriovenous Malformation Radiosurgery Study Group. Int J Radiat Oncol Biol Phys. 2000;46(5):1143-8. Gross BA, Storey A, Orbach DB, et al. Microsurgical treatment of arteriovenous malformations in pediatric patients: the Boston Children’s Hospital experience. J Neurosurg Pediatr. 2015;15(1):71-77. Nicolato A, Lupidi F, Sandri MF, et al. Gamma Knife radiosurgery for cerebral arteriovenous malformations in children/adolescents and adults. Part II: Differences in obliteration rates, treatment-obliteration intervals, and prognostic factors. Int J Radiat Oncol Biol Phys. 2006;64(3):914-921. Murphy ES, Suh JH. Radiotherapy for vestibular schwannomas: a critical review. Int J Radiat Oncol Biol Phys. 2011;79(4):985-997. Pollock BE, Driscoll CL, Foote RL, et al. Patient outcomes after vestibular schwannoma management: a prospective comparison of micro-surgical resection and stereotactic radio-surgery. Neurosurgery. 2006;59(1):77-85; discussion 77-85. Régis J, Pellet W, Delsanti C, et al. Functional outcome after gamma knife surgery or microsurgery for vestibular schwannomas. J Neurosurg. 2002;97(5):1091-1100. Choi JW, Lee JY, Phi JH, et al. Clinical course of vestibular schwannoma in pediatric neurofibromatosis Type 2. J Neurosurg Pediatr. 2014;13(6):650-657. Brackmann DE, Fayad JN, Slattery WH, et al. 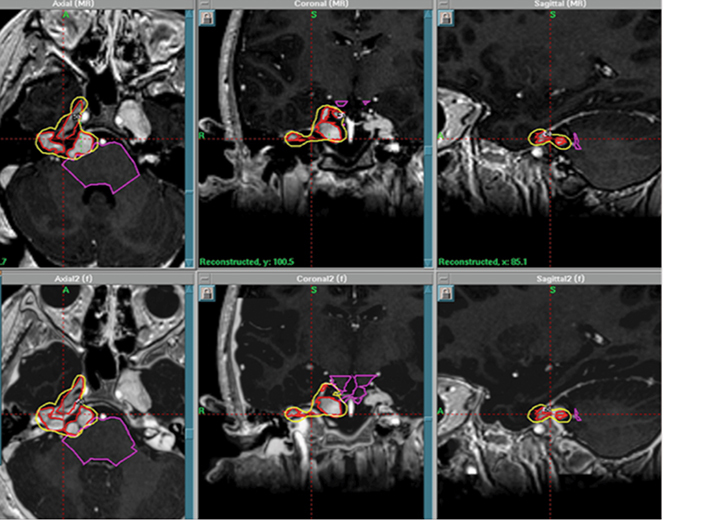 Early proactive management of vestibular schwannomas in neurofibromatosis type 2. Neuro-surgery. 2001;49(2):274-280; discussion 80-83. Plotkin SR, Stemmer-Rachamimov AO, Barker FG, et al. Hearing improvement after bevacizumab in patients with neurofibromatosis type 2. N Engl J Med. 2009;361(4):358-367. Kobayashi T, Kida Y, Mori Y, et al. Long-term results of gamma knife surgery for the treatment of craniopharyngioma in 98 consecutive cases. J Neurosurg. 2005;103(6 Suppl):482-488. Jo KW, Shin HJ, Kong DS, et al. Treatment outcomes of pediatric craniopharyngioma: a 15-year retrospective review of 35 cases. J Korean Neurosurg Soc. 2012;52(1):37-41. Miller RW, McKay FW. Decline in US childhood cancer mortality. 1950 through 1980. JAMA. 1984;251(12):1567-1570. Suki D, Khoury Abdulla R, Ding M, et al. Brain metastases in patients diagnosed with a solid primary cancer during childhood: experience from a single referral cancer center. J Neurosurg Pediatr. 2014;14(4):372-385. You SH, Lyu CJ, Kim DS, et al. Second primary brain tumors following cranial irradiation for pediatric solid brain tumors. Childs Nerv Syst. 2013;29(10):1865-70. Rowe J, Grainger A, Walton L, et al. Risk of malignancy after gamma knife stereotactic radiosurgery. Neurosurgery. 2007;60(1):60-5; discussion 5-6. Sahgal A, Aoyama H, Kocher M, et al. Phase 3 trials of stereotactic radiosurgery with or without whole-brain radiation therapy for 1 to 4 brain metastases: individual patient data meta-analysis. Int J Radiat Oncol Biol Phys. 2015;91(4):710-717. Healey EA, Barnes PD, Kupsky WJ, et al. The prognostic significance of postoperative residual tumor in ependymoma. Neurosurgery. 1991;28(5):666-671; discussion 71-72. Sutton LN, Goldwein J, Perilongo G, et al. Prognostic factors in childhood ependymomas. Pediatr Neurosurg. 1990;16(2):57-65. Lo SS, Chang EL, Sloan AE. Role of stereotactic radiosurgery and fractionated stereotactic radiotherapy in the management of intracranial ependymoma. Expert Rev Neurother. 2006;6(4):501-507. Kano H, Yang HC, Kondziolka D, et al. Stereotactic radiosurgery for pediatric recurrent intracranial ependymomas. J Neurosurg Pediatr. 2010;6(5):417-423. 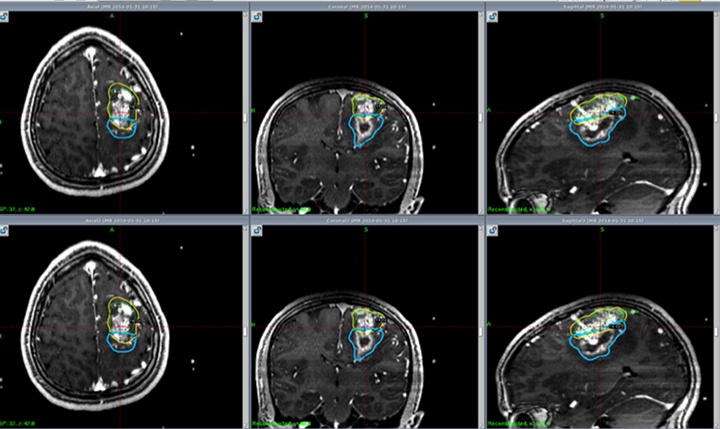 Weintraub D, Yen CP, Xu Z. Gamma knife surgery of pediatric gliomas. J Neurosurg Pediatr. 2012;10(6):471-477. Kano H, Niranjan A, Kondziolka D, et al. Stereotactic radiosurgery for pilocytic astrocytomas part 2: outcomes in pediatric patients. J Neurooncol. 2009;95(2):219-229. Marcus KJ, Goumnerova L, Billett AL, et al. Stereotactic radiotherapy for localized low-grade gliomas in children: final results of a prospective trial. Int J Radiat Oncol Biol Phys. 2005;61(2):374-379. Mellon RD, Simone AF, Rappaport BA. Use of anesthetic agents in neonates and young children. Anesth Analg. 2007;104(3):509-520. Hodgson DC, Goumnerova LC, Loeffler JS, et al. Radiosurgery in the management of pediatric brain tumors. Int J Radiat Oncol Biol Phys. 2001;50(4):929-935. Flannery T, Kano H, Martin JJ, et al. Boost radiosurgery as a strategy after failure of initial management of pediatric primitive neuroectodermal tumors. J Neurosurg Pediatr. 2009;3(3):205-210. Patrice SJ, Tarbell NJ, Goumnerova LC, et al. Results of radiosurgery in the management of recurrent and residual medulloblastoma. Pediatr Neurosurg. 1995;22(4):197-203. Milker-Zabel S, Zabel A, Thilmann C, et al. Results of three-dimensional stereotactically-guided radiotherapy in recurrent medulloblastoma. J Neurooncol. 2002;60(3):227-33. King D, Connolly D, Zaki H, et al. 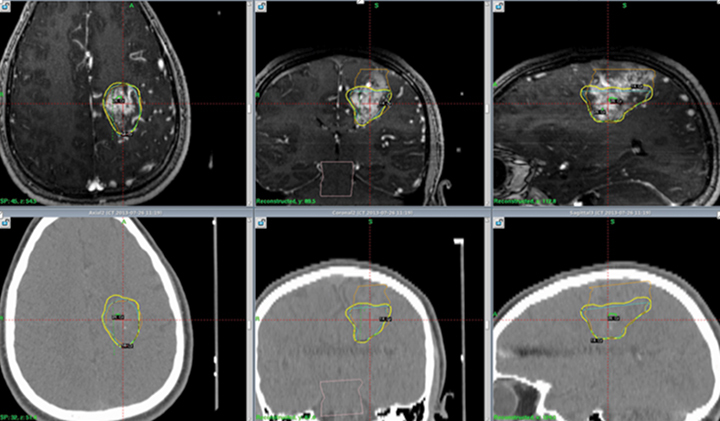 Successful treatment of metastatic relapse of medulloblastoma in childhood with single session stereotactic radiosurgery: a report of 3 cases. J Pediatr Hematol Oncol. 2014;36(4):301-304. Nanda R, Dhabbaan A, Janss A, et al. The feasibility of frameless stereotactic radiosurgery in the management of pediatric central nervous system tumors. J Neurooncol. 2014;117(2):329-335. Keshavarzi S, Meltzer H, Ben-Haim S, et al. Initial clinical experience with frameless optically guided stereotactic radiosurgery/radiotherapy in pediatric patients. Childs Nerv Syst. 2009;25(7):837-844. Kamata K, Hayashi M, Nagata O, et al. Initial experience with the use of remote control monitoring and general anesthesia during radiosurgery for pediatric patients. Pediatr Neurosurg. 2011;47(2):158-166. Kamata K, Hayashi M, Muragaki Y, et al. How to control propofol infusion in pediatric patients undergoing gamma knife radiosurgery. Acta Neurochir Suppl. 2013;116:147-150. Chao ST, Ahluwalia MS, Barnett GH, et al. Challenges with the diagnosis and treatment of cerebral radiation necrosis. Int J Radiat Oncol Biol Phys. 2013;87(3):449-457. Rahman M, Hoh BL. Avastin in the treatment for radiation necrosis: exciting results from a recent randomized trial. World Neurosurg. 2011; 75(1):4-5. Dashti SR, Spalding A, Kadner RJ, et al. 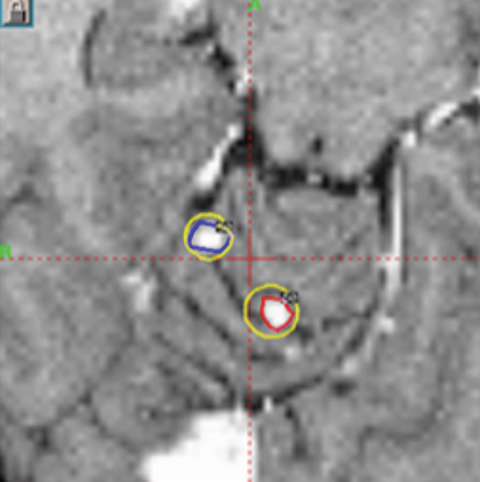 Targeted intraarterial anti-VEGF therapy for medically refractory radiation necrosis in the brain. J Neurosurg Pediatr. 2015;15(1):20-25. Nath SK, Carmona R, Rose BS, et al. Observed magnetic resonance imaging changes in pediatric patients treated with stereotactic radiosurgery for intracranial tumors. Childs Nerv Syst. 2011;27(3):399-406. Pediatric radiosurgery: A review. Appl Rad Oncol. Dr. Edward W. Jung is a board-certified radiation oncologist at Therapeutic Radiology Associates, Hagerstown, Maryland. Drs. Murphy and Chao are assistant professors; and Dr. Suh is chair, Department of Radiation Oncology, Rose Ella Burkhardt Brain Tumor and Neuro-oncology Center, Cleveland Clinic Foundation, Cleveland Ohio. Dr. David L. Jung is a medical student at Case Western Reserve Medical School, Cleveland, Ohio.